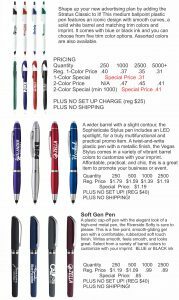 Every business owner knows that promotional products are the best form of advertising because they are useful and needed by your target audience. 85% of consumers remember advertisers who give them a promotional product. And you know what makes them an even better marketing investment? FREE SHIPPING. For the next 10 days, in plenty of time for holiday business giving, you can enjoy these specials and receive FREE SHIPPING, too! 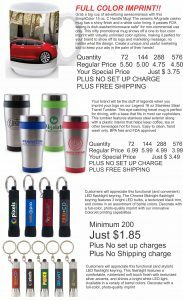 You also get FREE SHIPPING on any promotional product marketing idea. Call us for personal service for you and your company (the specials also give you a FREE SET UP valued between $35 and $50). This is a great time for you to re-order any product you have bought from us in the past and get FREE SHIPPING. 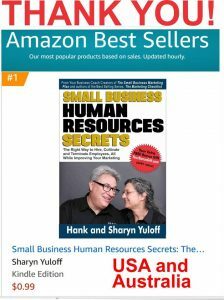 You get your free copy of our new book: Small Business Human Resources Secrets, a best seller on Amazon. You also get a free seat in our Small Business Marketing Plan bootcamp. Have your entire marketing plan together in just 2 ½ days. Prior to the bootcamp, you also get a free 30-minute Marketing focus call. Everyone always get a breakthrough which immediately improves their sales. All this is in addition to FREE SHIPPING on your promotional product orders. This FREE SHIPPING special is good for each order you place before 11/27/18. To take advantage of this offer, please email your order to info@YuloffCreative.com or call us at 800.705.4265 and ask to talk to Hank. Bytheway, this is not the only Black Friday Special we will be running. We will also be offering our online product at quite the discount. Our affiliates received a sneak peak at this offer. If you have an interest in The Small Business Marketing Plan, and/or joining our affiliates and earning some extra money for the holidays, please send us an email to request info.